Effective leadership styles, Is Your Leadership Style Still Effective? Imagine someone who wants more than anything to develop an athletic physique in order to build strength and speed. He starts replacing real food with supplements. He starts to train incessantly, pushing himself harder and harder. He sees results. He does get stronger and faster. Inevitably, however, the behaviors reach their maximum result. His body stops improving, and the pleasure derived from self-improvement also plateaus. The methods that created these results no longer work. Now he has to figure out a new way to behave—a new, and hopefully less extreme, strategy to make himself feel good. Leadership techniques can be similar. 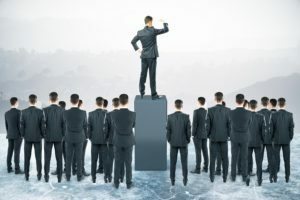 Leaders can become entrenched in a particular style when, after experiencing an initial success, they adopt the style as a sole “winning strategy”. The reality is that effective leadership styles change and evolve with the culture that we operate in. To stay fixed or rigid in a particular style, especially if the results are no longer as forthcoming can actually stunt a leaders development and efficacy. How can leaders overcome this challenge? According to the Workplace Bullying Institute (WBI), some 54 million Americans experience bullying at work. While coworker-to-coworker bullying does happen, the majority of offenders (72 percent) are bosses. The effects on subordinates can be significant, including increased stress, health issues, panic attacks, difficulty with decision-making, loss of concentration, low self-esteem, poor productivity, and isolation. Additionally, those on the receiving end may embrace similar tactics with others. A study conducted by University of Manitoba researchers found that the ramifications of bullying are even greater than those of sexual harassment. What this research shows is just how uncommon it is that “effective leadership styles” are studied or adopted in the work place. My client may have experienced difficulty being heard, understood, or taken seriously at other points in his life and discovered that, if he lost his temper and yelled, berated, or threatened someone, he achieved a result. Whomever was involved did what he wanted, and my client’s behavior was reinforced by the outcome. This was how he could get things done! Perhaps the idea—even subconsciously—was, “I’ll remember to do that again!” Why not do it again? It had worked! Without much thought, he set the trap and adopted bullying as his “best style” and “winning strategy.” My client produced success, at some level, so he carried it forward and never changed. However, like the would-be athlete, the style would inevitably hit a point where it was no longer effective in creating the results he wanted and needed. This was exactly the position in which my client found himself; worse, his team was rebelling. By standing up to the bullying boss, his team said, “We don’t like working with this person. He has a temper. He doesn’t listen and insists on winning every argument.” The pushback was evident, and his supervisors stepped in, demanding that this behavior be changed. His “winning strategy” had been deemed inappropriate and unacceptable, and his position was at risk. According to the WBI, the majority of businesses do little or nothing about *bullying. Fortunately for this team, this company was not one of them. They recognized the problem, and this manager received coaching to address the situation. What does the process of changing an entrenched behavior entail? The first step is to focus on the behavior and determine how it developed. What was the reason for adopting this entrenched behavior? What was the reason for believing that it was appropriate in the first place? Why did my client stick with it? If I can help a person understand their motivation, then a much better chance exists to help shift into a new paradigm and abandon the old methods. In our coaching work, we moved forward towards a new communication style, focusing on different future outcomes. As we moved through the process, the coachee and I tested different methodologies and tested new communication styles. Practice and role-playing were critical at this juncture. When my client put himself into others’ shoes, he got a better sense of the impact of his current style. He also discovered the benefits that differing communication styles could deliver. The changes were amazing, and he has moved on with grace and influence. The proof of effective leadership styles is in the results! These conversations must continue over a period of time. Changes of this nature do not occur magically or overnight. Entrenched behavior has taken root. The chance to shift that belief system and replace it with a better, more productive strategy takes patience. When leaders have a “winning” style that is no longer producing the results they need, it becomes necessary to change it and discover new effective leadership styles. Whether the behavior is bullying or being too lenient, being a dictator or being indecisive, it can negatively impact the team and the leaders’ ability to act through them.